Birching table in the museum of Fort William. 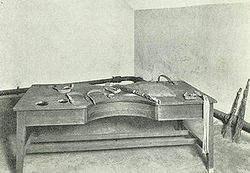 Photo of a "whipping table for young delinquents" in a Scottish prison (1909). A drawing of a similar birching table, also from Scotland, 19th century. 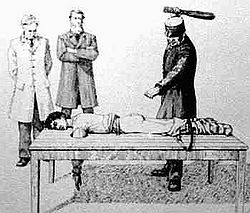 A whipping table or birching table is an item of spanking furniture that resembles a table with some design modifications. It is similar to a whipping bench, but is higher and more like a table. The table top has holes through which the delinquent's arms were put. This item was typically used for judicial corporal punishment of young delinquents in Scotland. Up to 1948, when judicial corporal punishment was abolished in Scotland, birching had been a relatively common punishment for boys aged between 8 and 16 for offences such as petty theft, cruelty to animals, and vandalism. The table in the photograph to the right is from the South Prison in the Justiciary Buildings in Saltmarket, Scotland, 1909. It has two pairs of arm holes, one for older and one for younger boys. There are also six straps to restrain the delinquent, and something that looks like a cushion to be put under the delinquent's pelvis. The birching would always be given on the bare buttocks. The table has two cutaways that permitted a closer distance to the delinquent's center, which was probably useful when strapping down the boy. It seems unlikely that the cutaways may have also served to make the delinquent straddle the table: the cutaways are not deep enough for that. The photo also shows three birch rods of different size ready for use. The choice of rod depended on the age and size of the offender, with the smallest reserved for 8- to 10-year olds and the largest for adults. Boys under 14 years of age could receive a maximum of 12 strokes. Those aged 14 and 15 could receive a maximum of 36 strokes. There is another interesting implement on the photo: At the very right of the table, there is something that looks like a cross-breed between a tawse and a flogger. Inveraray Jail in Scotland is a prison museum that has an actual whipping table that visitors can try out ("but make sure you know who is holding the birch!"). On this table, boys under 14 could receive up to 12 lashes, while boys over 14 could suffer as many as 36. Girls were never birched. This page was last edited on 10 July 2015, at 16:14.